Take your performance to the next level with the MFactory PRO Series Gears. Recognizing the demand for transmission components that can withstand the extreme shock loads produced during Drag Racing, MFactory Competition Products are proud to offer our range of top-tier competition level gears. Final drive gears are cut from high quality fully-carburized forged nickel-chromoly steel while also benefitting from a proprietary heat treatment process. 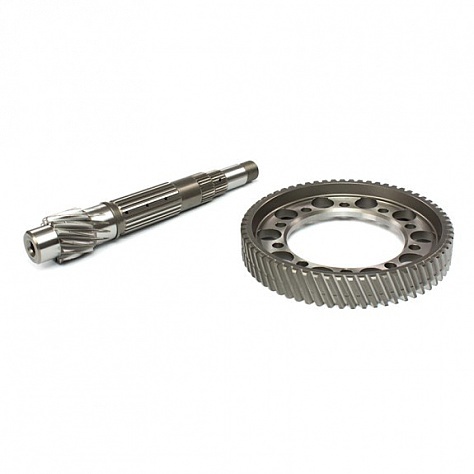 As a result we are proud to offer enthusiasts the best final drive gears on the market today. By changing you final drive gear ratios, you can experience a dramatic increase in acceleration, giving you on average a 10-15% increase in torque throughout the entire rev-range over the OEM final drive. Made from imported Japanese steel these final drives are 'forged' and 'cryo-tempered' for unsurpassed toughness. As used on several Championship winning race cars.